If you were going to do something 15,000+ times, wouldn't you want to make sure you were doing it right? And by right, I mean with the least amount of associated discomfort. Well, quick math ... shaving 6 times a week (one day off for good behaviour) - 52 weeks a year - for 50 years (this could easily be 60+) ... that's 15,600 shaves! 15,600 times you are going to drag a sharp blade across your skin, removing not only unwanted hair, but skin cells and natural oils that work to protect your skin... your skin deserves some help! 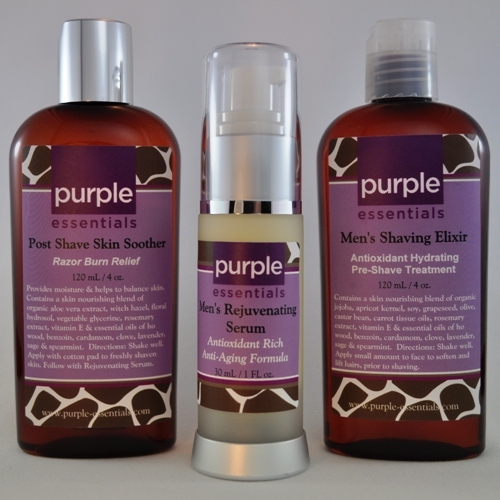 Purple Essentials has developed a line of premium, plant-based, skin nourishing products to help you create an efficient and enjoyable shaving routine that protects, soothes and rejuvenates your skin ... we hope, 15,000+ times! 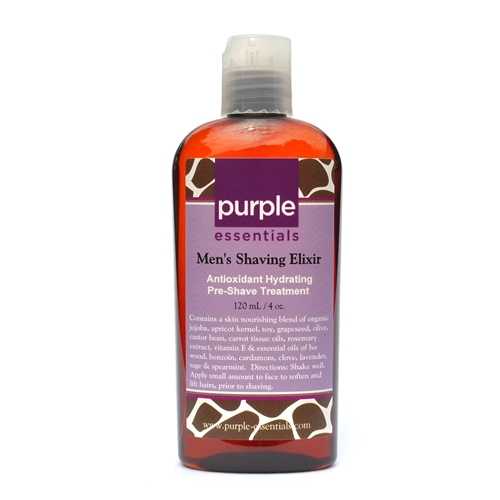 Men's Post Shave Skin Soother - Razor burn relief. Provides moisture while helping to soothe the skin following shaving. A refreshing hydrating mist of soothing botanicals and anti-ageing, anti-inflammatory essential oils, to help soothe, tone and balance your skin, following a close shave. Cooling Aloe Vera Juice, Witch Hazel (alcohol free), Ho Wood, Lime and Clove Bud help to provide immediate relief to freshly shaven skin, while Spearmint, Lavender and Basil help to prevent ingrown hairs and encourage skin healing. Suitable for all skin types, including sensitive. 4 oz. $24 *Used following a shave and anytime you require a refreshing pick-me-up. Comes with an atomizer spritzer top, for easy application. 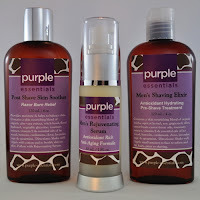 Men's Rejuvenating Serum - Soothe and helps to protect your skin from harsh external elements, and every day pollution. Antioxidant rich, anti-aging formula. Effectively lessen the appearance of lines and wrinkles while providing improved hydration and resilience to your skin. Packed with skin nourishing vitamins, cell regenerating antioxidants and concentrated hydration properties, this blend of skin nourishing oils can help to restore and advance your skin's preservation systems. A fortified blend of pure and organic Botanical Oils, Evening Primrose, Carrot Tissue, Aloe Vera Juice, Vitamin C and essential oils of Ho Wood, Lavender, Frankincense, Myrrh and Jasmine. 1 oz. $58 Suitable for all skin types, including sensitive. 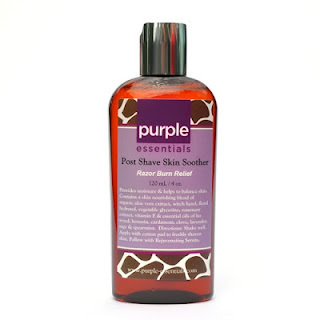 Use following Post Shave Skin Soother and or before bedtime. 15,000 looks like a much smaller number.